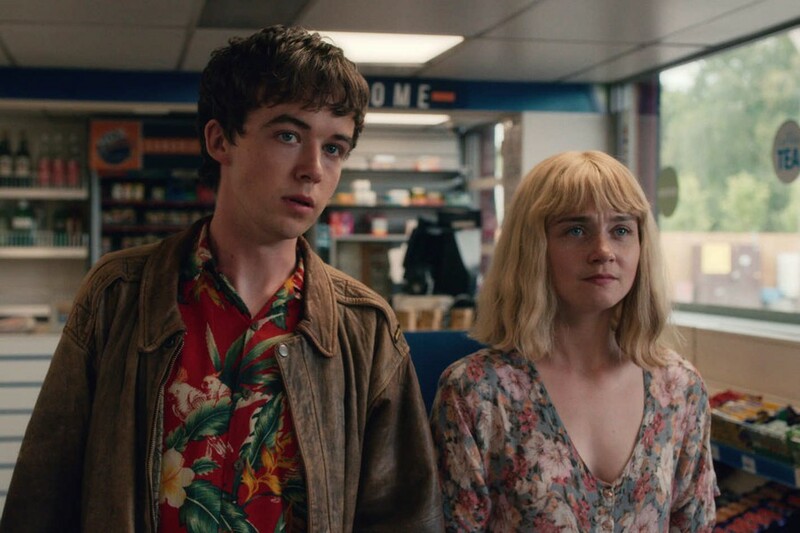 The End of the F***ing World is one of Netflix’s latest original series that defies clichéd expectations of comedy, romance, and youthful innocence. Its eight-episode season crafts a story about two unconventional teenagers whose tumultuous realities converge in a harmonious friendship, even though getting there involves running away from home, crashing a car, and running out of money at a fast food joint. Alyssa thinks she could fall in love with James, and he believes she could be his first murder victim. So blossoms the romance between an awkward psychopath and an abrasive loner who decide to run away together. Yet, just as the timeless narration in 500 Days of Summer warns upfront that the film is not a love story, this series is not a hot and heavy romance, nor is it a commentary about young love or mental illness: It is focused on the youthful innocence and bravery that emerge as James and Alyssa are unwillingly thrown into the grim realities of adulthood. Each episode works to distinguish the show from a stereotypical coming-of-age drama. In the opening montage, while James reveals how he intentionally put his hand in a deep fryer and occasionally murders his neighbors’ animals, Bernadette Carroll’s cover of the 1946 ballad “Laughing on the Outside” plays in the background—an airy choice for such a dark moment. But it is precisely the show’s unique aesthetic, evoking nostalgia and coupling it with dark realities, that reels us in. It takes true artistry to make someone as difficult as James remotely likable; despite his fixation with death and his stated mission to murder Alyssa, James is quite charming. The story is as much Alyssa’s as it is James’s. While her sardonic humor might be difficult to digest, she immediately establishes herself as a forthright woman. Instead of throwing around platitudes and ostensible words of wisdom, Alyssa is impactful in an unconventional way. Her relentless persistence establishes her role as the leader in their adventure, and she ultimately challenges traditional expectations of female characters. Rather than adhering to sexist tropes of obedience, submission, and a gentle demeanor, Alyssa is brash, outspoken, and pioneering. For those who do not particularly like her character, perhaps it would be worthwhile to dissect feminine likability. Alyssa reinvents the female protagonist. Although strong, the series is not without its flaws. Those seeking an in-depth look at depression or an evaluation of complicated family dynamics might be disappointed. Although these themes are essential in creating compelling and robust characters, they do not drive the plot. James and Alyssa, in their present moments, with every trivial action, do. Early on, we learn that James lives with his father, and that their dysfunctional relationship stems from a childhood tragedy. Alyssa lives with her mother, stepfather, and their baby twins, and she is forced to play a behind-the-scenes role in her own home. While these dynamics and dysfunctions are essential in understanding some of James and Alyssa’s behaviors, they are not the primary focus. James and Alyssa create a story that is more compelling than their individual backgrounds. In doing so, they preserve, and perhaps even establish, their autonomy. Their circumstances are not binding, and despite their past trauma, they succeed together, perhaps challenging us to reconsider exactly what success is. Unbearable cliffhanger aside, this season culminates satisfyingly with a profound friendship that is sustained by James and Alyssa’s mutual respect and newfound empathy. James slowly transitions from his reserved and emotionally distant shell, and at the very end says, “I think I understand what people mean to each other.” Alyssa, through her own voiceover narration, reveals her own vulnerability, and eventually speaks some of these inner thoughts aloud. As the show juxtaposes innocence with vulgarity, it assumes an air of nonchalance even with the heaviest issues and makes typically unbearable personalities quite relatable and charming, making it impossible to extract a main takeaway. The show can be incredibly dark, unexpectedly funny, and undeniably moving. It is well worth the three-hour binge.